1980s: A small number of BAPS devotees in the Atlanta area met weekly for worship in one another’s homes. 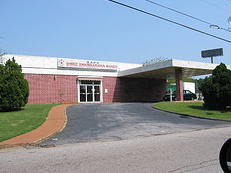 1988: BAPS devotees purchased a skating rink in Clarkson, Georgia and refurbished it as a mandir. 1980s: The number of Indian immigrants in the U.S. grew dramatically. 2000 (February): A twenty-nine acre plot of land was purchased just outside of Atlanta in Lilburn, Georgia to serve as the site for the planned mandir. 2000 (February): Pramukh Swami Maharaj performed a religious ritual (puja) to sanctify the land for the mandir construction. 2004: Pramukh Swami Maharaj arrived in Atlanta for a visit. 2005 (September): Ground was broken for the mandir construction. 2007 (August): The mandir was formally inaugurated. A major wave of Asian immigration into the United States occurred during the 1980s, and Indian immigrants were a significant component of that immigration (Barringer 1990). In 1960, there were about 12,000 Indian immigrants in the U.S.; that number increased to 51,000 in 1970, 206,000 in 1980, and 450,000 in 1990 (Terrazas and Batog 2010). In 2010, the Indian population in Atlanta surpassed 100,000 by 2010 (Li 2013). Many of these immigrants were at least nominally Hindu. Originating in India in 1907, one of the most visible Hindu immigrant groups in the U.S. has been the Swaminarayan tradition. As Melton (2011:8) summarizes Swaminarayan tradition’s domestic and international growth: “It has emerged out of Gujarat to become a national movement, initially following the twentieth century dispersion of Gujaratis throughout India while also attracting many non-Gujaratis to its relatively modern, reformist, and communally active outlook. 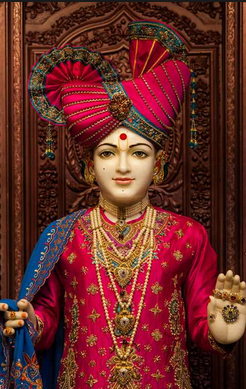 One of the most visible sectarian representations of the Swaminarayan tradition in the U.S. is Bochasanwasi Shri Akshar Purushottam Swaminarayan Sanstha (most commonly, BAPS). 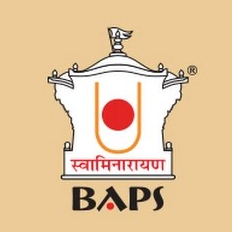 Currently, BAPS is estimated to include worldwide over 1,000,000 devotees, nearly 1,000 sadhus, over 3,000 mandirs and BAPS congregations, thousands of weekly assemblies, and very active humanitarian and charitable activity. BAPS is represented in over forty nations around the world. Fenton (1988) estimates there were a few dozen Swaminarayan families in the Atlanta area by the mid-1980s. By the early 2000s the number of worshipers approached 1,000 with much larger gatherings on feast days. BAPS devotees were included in that set of families. The BAPS determination to build a mandir began during the 1980s when devotees purchased a skating rink in Clarkson, Georgia and refurbished it as a mandir in 1988. Until the 1990s, sadhus were not allowed outside of India, but two regional sadhus took up residence adjacent to the new mandir in the early 1990s. As the number of BAPS devotees and their financial resources grew, devotees began to aspire to constructing a new mandir in the Atlanta area. For BAPS devotees, mandirs represent an important form of devotional expression and a means of promoting the survival of Swaminarayan Hinduism. With the support of their spiritual leader, Pramukh Swami Maharaj, the BAPS community began to plan for the construction of a carved stone mandir (shikharbaddh) (Kim 2010:367). As Kim observes, BAPS satsangis and leaders are continuously striving to improve their youth groups, publications, and methods of teaching Swaminarayan upasana for its transnational communities. Also, BAPS constantly seeks to improve the appeal and accessibility of its numerous programs and materials for both its followers and broader publics. The new temples have become a focal point for these developments” (Kim 2011:369). One expression of devotion and sacrifice by BAPS devotees is the rapid construction of new mandirs, which often takes place in two years or less and involves extensive volunteer labor. In the case of the Shri Swaminarayan Mandir just outside of Atlanta, land for the mandir was purchased in 2000, and that same month Pramukh Swami Maharaj performed a religious ritual (puja) to sanctify the land for the mandir construction. Pramukh Swami Maharaj returned to Atlanta in 2004 for a week’s visit, and the following year construction began. 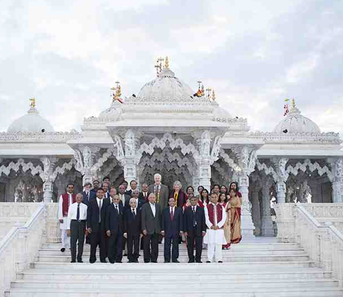 The temple was completed in less than two years, and in August 2007 the mandir was formally inaugurated. Caring for their spiritual, cultural, social, physical, emotional, and educational needs. Inspiring all towards a pure and peaceful way of life; filled with character, love, tolerance and harmony. Sustaining the universal values of Hindu culture. Fostering faith and devotion in God. In addition to the festivals and celebrations that are held throughout the year, worship rituals (bhakti), such as a morning bath followed by a puja, Ãrti, darshan, and satsang are offered daily. The Shri Swaminarayan Mandir in Atlanta is an impressive 32,000 square-foot temple. It is constructed out of over 4,500 tons of Italian Carrara marble, 4,300 tons of Turkish limestone, and 3,500 tons of Indian pink sandstone. The stone was quarried in the three respective nations and then shipped to India where carved craftsmen sculpted it into 35,000 separate pieces that were then shipped to Atlanta. The stone pieces from which the mandir is constructed interlock and therefore require no screws, nails or other fasteners. Nearly 1,000 volunteers joined over 1,000 craftsmen, investing over 1,000,000 hours of labor, in assembling the mandir, a process that was completed in less than two years (Grundhauser n.d.). A two-ton keystone was placed in the ceiling of the mandir’s central dome. Once completed the mandir now contains six tall pinnacles, 86 decorative ceilings, 116 archways, and 340 columns (Grundhauser n.d.). At the time it was constructed, the Shri Swaminarayan Mandir in Atlanta was the third shikharabaddha in the U.S. (preceded by mandirs in Houston and Chicago). It was also the largest Hindu temple outside of India. Since the Atlanta mandir’s construction an even larger BAPS shikharabaddha has been constructed in Los Angeles. The spiritual leader of the Shri Swaminarayan Mandir in Atlanta is Pramukh Swami Maharaj, who is regarded as the fifth spiritual successor of Swaminarayan. Pramukh Swami Maharaj is understood to have achieved the ultimate level of spiritual development (brahmanized) and in constant communication with God. He is the key spiritual link between BAPS devotees and God. 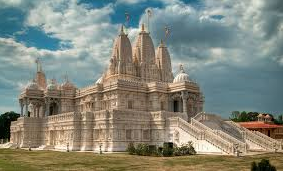 There has been some controversy over the construction of houses of worship in Lilburn, primarily mosques but also a mandir proposed by the Swaminarayan Satsang Mandir of Atlanta (Esterl 2011; “Gwinnett says no to Hindu Temple” 2006). By contrast, the Shri Swaminarayan Mandir has largely been welcomed. The mayor commented that “Lilburn has become a very diverse community, very international. As community leaders, we’ve embraced that diversity, and so we welcome it and see it as a very positive sign…” (Lohr 2007). The response from visitors has been one of awe: “Once inside the Mandir for the prayer service, we couldn’t help feeling possessed by the karmic field emanating from statued deities, impassioned revelers, glassy stone surfaces, theatrical up-lighting, and soporific music. Standing outside after the ceremony, we couldn’t help but marvel at the building’s unlikely surroundings that render it incongruent and otherworldly” (Sauser and LeFrancoi 2010). To nurture and train the children so they grow up to be peaceful and thoughtful citizens . . . The children are exposed to the glories of Indian Culture and Hindu traditions through audio video presentations. To keep the young from falling victims to the dangerous diseases like aggression, disobedience and intoxication, that destroy character and life, and to preserve the value of Indian Culture for our future generations, our Youth Center plays a vital role. With respect to accommodation, Kim (2011: 379) states that it is “accommodation without compromise to its central tenets that has allowed BAPS mandir s to be constructed wherever satsangis have settled.” The dual objectives are that The BAPS Swaminarayan Sanstha hopes to make Hinduism an approachable and appealing religion for all visitors and yet it also seeks to sharpen awareness of its own devotional tradition (Kim 2011:379). http://www.atlantamagazine.com/georgiatravel/explore-georgias-unexpected-attractions/ on 9 June 2015.
http://allhindutemples.com/city/georgia/hindu_temple/baps-shri-swaminarayan-mandir-atlanta/ on 9 June 2015. Barringer, Felicity. 1990. “Asian Population in U.S. Grew by 70% in the 80’s.” New York Times, March 2. Accessed from http://www.nytimes.com/1990/03/02/us/asian-population-in-us-grew-by-70-in-the-80-s.html on 9 June 2015. Esterl, Mike. 2011. “ Mosque Zoning Row Draws Scrutiny: Georgia City’s Opposition to Muslim Center Probed as Justice Department Steps Up Focus on Religious Property Disputes.” Wall Street Journal, August 13. Accessed fromhttp://www.wsj.com/articles/SB10001424053111904823804576504220337373868 on 20 June 2015. Grundhauser, Eric. n.d. “ BAPS Shri Swaminarayan Mandir Atlanta.” Atlas Obscura. Accessed from http://www.atlasobscura.com/places/baps-shri-swaminarayan-mandir-atlanta-2 on 9 June 2015 . “Gwinnett S ays N o to Hindu Temple.” 2006. The Atlanta Constitution, June 27. Accessed from http://www.freerepublic.com/focus/news/1658489/posts on 20 June 2015. Kim, Hanna. 2010. “Public Engagement and Personal Desires: BAPS Swaminarayan Temples and their Contribution to the Discourses on Religion.” International Journal of Hindu Studies 13:357–90. Li, Ivy. 2013. “The Indian State of Georgia: Hindu Temples in the South Offer Open Places of Worship.” Hyphen Magazine , Spring. Accessed from http://www.hyphenmagazine.com/magazine/issue-26-south-spring-2013/indian-state-georgia on 20 June 2015 . Lohr, Kathy. 2007. “Gleaming Hindu Temple to Open in Atlanta Suburb.” NPR, August 15. Accessed from http://www.npr.org/templates/story/story.php?storyId=12753002 on 20 June 2015. Melton, J. Gordon. 2011. “ New New Religions in North America: The Swaminarayan Family of Religions.” P aper presented at the annual meeting of the Center for Studies of New Religions (CESNUR), Aletheia University, Danshui, Taiwan, June 21-23. Rudert, Angela. 2004. Inherent Faith and Negotiated Power: Swaminarayan Women in the United States. MA Thesis. Ithaca, NY: Cornell University. Sauser, Jeff and Josh LeFrancoi. 2010. “ BAPS Mandir: Politics, Peace, and Harmony in Atlanta’s Suburbs.” BURNAWAY, March 13. Accessed from http://burnaway.org/feature/baps-mandir-politics-peace-and-harmony-in-atlantas-suburbs/ on 20 June 2015. Terrazas, Aaron and Cristina Batog. 2010. “Indian Immigrants in the United States.” Migration Policy Institute, June 9. Accessed from http://www.migrationpolicy.org/article/indian-immigrants-united-states-1 on 9 June 2015.